I’ve been sitting on this column idea for almost eleven months, waiting for Mother’s Day to roll back around, because I can’t think of a better occasion on which to share this story. Early last summer, when the morning fog was still heavy, I was weeding my zinnia bed. Suddenly, from the wooded area across the road from my house, something came crashing through the underbrush. I looked up just in time to see my dogs, tails tucked between their legs, charge into the front yard. In hot pursuit was a deer, head lowered and smoke coming out its nostrils. (Okay, okay, there wasn’t really smoke. But the deer was clearly steamed.) Sophie—a.k.a. the cutest dog in the whole wide world–dashed up the hill to the neighbors’ yard. Iniesta disappeared beneath the low-lying limbs of the giant pine tree in my front yard. The deer followed. And then there was silence. I whistled. Here came Sophie, contrite and trembling, down the hill. But Iniesta didn’t emerge from the pine thicket. Was she lying in there, wounded? Or worse? And was the enraged deer still in the thicket with her, ready to assault me when I came to the rescue? There was nothing to do but find out. I made my way gingerly into the thicket only to discover it vacant. No dog. No deer. I walked around the house and found Iniesta on the back porch, panting hard but unhurt. The deer was nowhere in sight. I sank onto the porch step, wishing I could figure out what had caused the attack. Was the deer an aggressive buck, angry at being disturbed as he roamed the woods? Possibly. Male deer have no antlers in summer, so this could very well have been an alpha buck. Could the deer have been rabid? Also possible. A 2004 online article in “Field & Stream” magazine says that rabid whitetail bucks have been know to harass horses and chase hunting dogs. I could only hope the deer had returned from whence it came and would leave us be. That’s not what happened. A couple of hours after the brouhaha, the dogs and I headed to the mailbox to see if the postman had left anything. Here came a deer, which I could only assume to be the same one we’d encountered that morning, sauntering down the middle of the road. Sophie and Iniesta moved closer to me and watched as the deer slipped into the small patch of woods behind my house. I shut the dogs in the garage and went to get the binoculars. This being a Mother’s Day column, you can probably guess what I saw when I twisted the lenses into focus. The big deer was joined by two tiny fawns, astonishingly well-camouflaged in the dappled sunlight by their white spots and tawny fur. 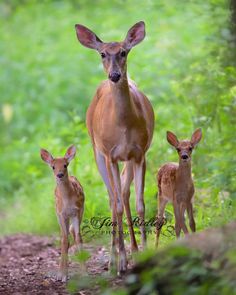 A mama doe and her twins, all three on high alert. I watched them for ten or fifteen minutes, marveling that they could stand so absolutely still for so long. Judging by their size, the babies couldn’t have been more than a few days old. But they would mature in a hurry. Does wean their fawns when they’re a couple of months old, after which the babies forage for vegetation just like adult deer. The mother keeps them with her for at least a year, if they’re sons, and up to two years if they’re daughters. And the doe often returns to the same spot to give birth. Here’s hoping that will happen next month in my woods. And that my dogs will have the good sense to stay on the porch.